Coming to a reputable digital distributor near you is Cargo Commander, a PC and Mac only title from Serious Brew, a tiny two man team from the Netherlands. It’s an arcade title of a platforming nature, with a little bit of strategy thrown into the mix with randomly generated content. The aim? To survive your first day at work, to keep hold of a monstrously large coffee mug (it makes you move faster) and to collect cargo, to scramble through containers filled with mutants and mazes, drag it all home and level up to CARGO COMMANDER. Of course the main aim is to traverse your way through the crates as quickly as possible, gathering all the cargo that you can before the containers are all sucked away by a marauding wormhole. Aiding you in your task are (put on an awesome man voice to say this) the Platform Drill and the FistCannon, which can drill through pretty much anything and be used to lethal effect respectively. Using this trusty man tools, you can drill through platforms and walls, fling yourself into space, whip around a container and drop in on the other side – assuming you don’t run out of breath first. 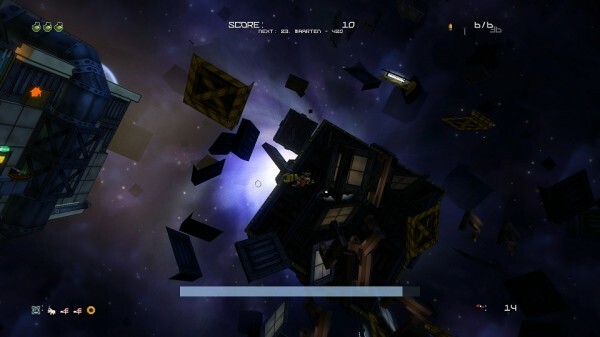 The physics of the game is very neat and tidy, and some of the containers even feature gravity switches to add another dimension to play. Burrowing into the containers, you never quite know what you’re going to find, especially when you make your own door! Monsters might lurk within, a labyrinth, an annoyingly placed flamethrower – you just never know. Given the speed with which you aim to fling yourself through these things, these extra elements and surprises add a bit more of a challenge – some of the mazes can stump you completely if you’re not thinking on your feet. Should you push ahead to the furthest container and risk a long trip through open space or methodically pick up every bit of cargo? Take on the enemies or burrow past them? There’s some light strategy involved for sure. The cargo you’re collecting is a bunch of amusingly named junk of varying rarities, and gathering all of the different types gradually grants you promotions -which come with various ship upgrades. An upgrade bench is quickly unlocked so you can improve your weaponry, speed and health, and later unlocks fulfil other nifty functions such as spawning health and repairing your ship if you’ve been a bit too drill happy. Stage progression is handled by splitting things into sectors – you can even name and generate one yourself – and to unlock and travel between them you need to find a sector key somewhere within the containers. Although there is no multiplayer, the high scores of other players are tightly integrated into the game, cleverly framed within the employment setting by using them as a kind of ‘Employee of the Month’ system – if you have the highest score in the sector you get to sport a rather nifty gold crown. There are no hitches with the gameplay as such; rather your relationship with Cargo Commander will rest on how willing you are to become addicted to something for the sake of high scores and unlockable swag. The gameplay is fun in itself, but aside from a few weapons and upgrades, nothing really changes, and the randomly generated nature of the levels means that any difficulty curve is more of a squiggle. There is something of a story driving you to the highest rank so you can go home to the wife and kid, but it’s kept firmly in the background via emails that pop up on the space ship’s console. Thankfully the game goes in for character instead of story, and has a funny bone of the quirky variety that seeps into some of the design choices and the overall feel of the game. Presentation wise Cargo Commander does a solid job. Things mesh together well and although there are no fancy destruction animations going on, what’s going on is always clear. Being able to zoom in and out to such a large degree is also of huge benefit, and reveals pleasant little details in some of the environments. Spend some time checking out the space ship in particular and you’ll detect a game made with care. 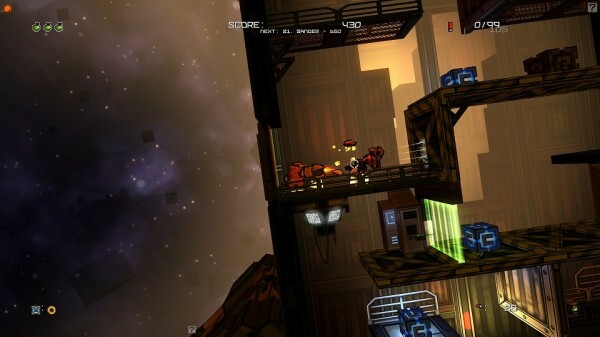 The cartoony style is well suited to the gameplay, with some nice lighting and strong colours making for a vivid world. Those aforementioned little details go a long way, with little oddities like the cap wearing enemies (caps are the game’s currency so in some lunatic way killing monsters for cash finally makes sense)more entertaining than any extra textures or polygons ever could be. The promised bluegrass soundtrack is a great idea not perfectly executed. The tone of the stuff is perfect for the whole working man set up and energetic and different to boot, but there aren’t enough tracks to keep things fresh and so it becomes far too easy to mute and replace with your own. Of quality build and potentially addictive, Cargo Commander has a neat idea at its core, along with a small but essential dollop of soul. The gameplay isn’t instantly bewitching nor anything particularly new, but there’s nothing offensive here either. It feels like a portable title, or failing that, something to sit snugly on the desktop somewhere between Minesweeper and Skyrim.